YANGON— After a delay of three months, a water bus service on Yangon’s rivers rolled out on Friday, offering a new transport option to the city’s 5.2 million residents. 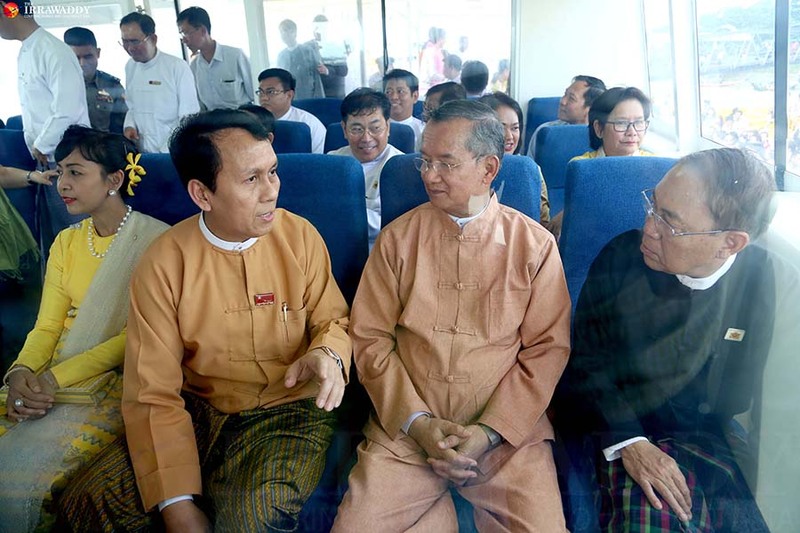 Thirteen boats will connect Bohtataung and Insein townships with seven stops in between under the first phase of the project which launched Friday, Daw Tint Tint Lwin, the chairwoman of Tint Tint Myanmar company which won a tender to provide water bus services in February, said at the launching ceremony. Three imported boats from Australia which can carry each 180-230 passengers, three boats from Thailand which can carry 60 passengers and seven locally constructed boats which can carry 150 passengers will run between 6:30 a.m. to 6:30 p.m. every day. The stops include Bohtataung Terminal (Bohtataung Pagoda compound), Nan Thi Da Terminal (Pansodan Street), Lan Thit Jetty (Lan Thit Street), Kyee Myindaing Terminal (Kyee Myaing Kanar Road, near Zay Gyee Street), Hlaing Terminal (Hlaing Station Road, next to Shwe Padauk Fish market), Punn Hlaing (Punn Hlaing Golf Estate) and Insein Terminal (Aung Zay Ya Bridge). The chairwoman said it takes about two hours to drive from Insein to Botahtaung, but by the water buses, it will only take around 45 minutes. Yangon Chief Minister U Phyo Min Thein said at the launching ceremony that he hopes the new water transport will be helpful for the traffic congestion on Yangon’s roads which has caused commuter journeys to lengthen, pledging the government was strict in ensuring the tender-award winning company was up to standard on safety and security. The service was previously planned to launch in late June. Daw Tint Tint Lwin told The Irrawaddy that there had some delay in importing boats because of bad weather and also in arranging the required documents with the related government departments for the project. She said based on the customers’ demand, the routes and stops will be expanded under the Yangon regional government’s instructions. Two routes along Nga Moe Yeik Creek and Thanlyin Township will follow within three to six months after the jetties have been constructed, she said. Some 56 to 67 boats are expected to service the full operation, which aims to serve an annual 12 million commuters this year and a projected 24 million by 2020. “I hope to get full customers on all 13 boats under phase one as even in the trial there was high demand,” she added. She added that Yangon Region Transport Authority is also arranging to expand the bus lines that connect the water bus terminals. Commuters will use a top-up card payment system with water bus rides costing between 300 and 500 kyats.